On the sunny and hot morning of Saturday 28th March we held our Spring volunteer event. It was so warm that I rushed home to grab a hat and sun cream before the proceedings began. Per usual we gathered around the base camp tent to receive instructions. There were four main tasks for this event. Fiona was in charge of seeding the front and back meadows. idverde kindly used a digger to remove the surface grass, as the last time we tried to do this by hand, we all nearly has heart attacks. Bryn and his team cut and made a path through the garlic copse next to the birdfeeder. This path now links the playing fields to the back of the park. The rest were split into two teams. One planting seeds around the pond and the other clearing, seeding the bluebell copse. And I mustn’t forget those who did a sterling job litter picking. On the rather chilly morning of the 26th of January we had our first volunteer meet of the year. We set up base-camp in the usual spot in the meadow by the pond. Our mission was to clear a paths through the pond area, litterpick and set up a bird feeding station in the garlic copse. Bryn and Don did sterling work in building the bird feeding station. There was also a bird themed treasure-hunt. And in the base-camp a table for making bird feeding balls out of seed and lard. These were later hung up at the bird feeding station. Throughout the course of the day we had around 40 volunteers cutting their way through the brush by the pond and laying down woodchip to create new paths. During a well deserved tea break Bryn gave us a wonderful lecture on the birds that inhabit the park. After the break Nilesh came up with the great idea of removing the bramble next to the private land. And this has really opened up the space. A big thank-you to all the volunteers, especially those that were handing out the tea and biscuits. Those were much needed on such a chilly day. And another big thank-you to idverde for supplying the tools and the trailer. We got so much work done! You can see what happened in the short video above. 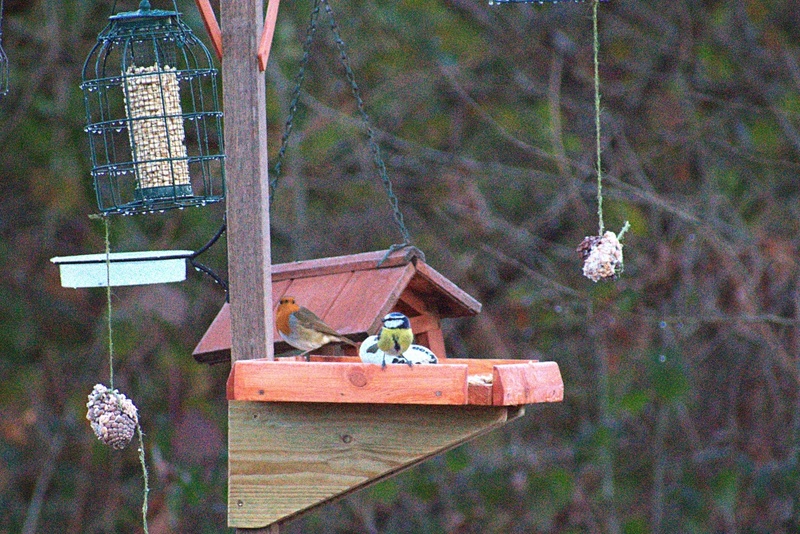 And the birds seem to be enjoying the feeding station.